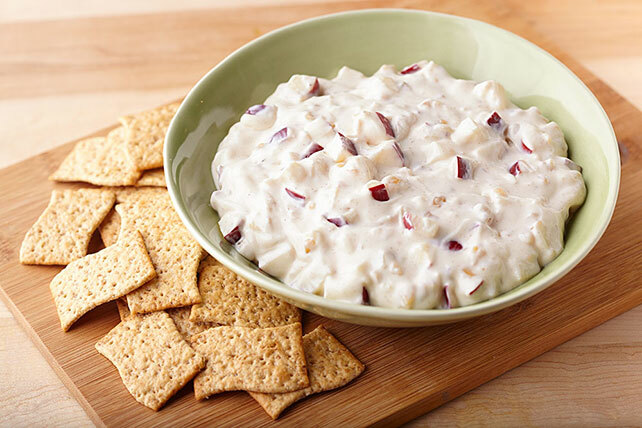 For a creamy, crunchy and sweet dip, just let Neufchatel cheese, honey, chopped apples and walnut pieces do what they do best. This dip's a keeper! Beat Neufchatel, honey, lemon juice and cinnamon in small bowl with electric mixer on medium speed until well blended. Stir in apple and walnuts. Cover and refrigerate until ready to serve. Serve as dip with crackers. Garnish with additional apple slices, if desired. Prepare as directed, using reduced-fat thin wheat snack crackers. Use a crisp apple for this recipe, such as a McIntosh, Gala, Cortland or Fuji apple. Dip can be made up to 1 day ahead. Store, covered, in refrigerator.